Let us commit ourselves today to defend these values so that we can defend our freedom and protect our common civilization." 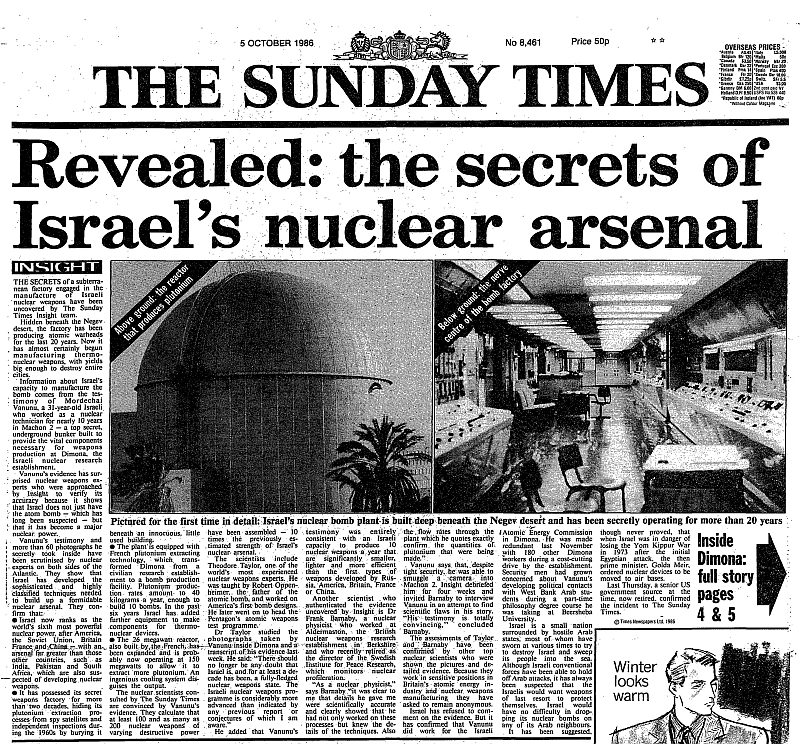 THE SECRETS of a subterranean factory engaged in the manufacture of Israeli nuclear weapons have been uncovered by The Sunday Times Insight team. Hidden beneath the Negev desert, the factory has been producing atomic warheads for the last 20 years. Now it has almost certainly begun manufacturing thermo-nuclear weapons, with yields big enough to destroy entire cities. Information about Israel's capacity to manufacture the bomb come from the testimony of Mordechai Vanunu, a 31-year-old Israeli who worked as a nuclear technician for nearly 10 years in Machon 2 - a top secret, underground bunker built to provide the vital components necessary for weapons production at Dimona, the Israeli nuclear research establishment. Vanunu's evidence has surprised nuclear weapons experts who were approached by Insight to verify its accuracy because it shows that Israel does not just have the atom bomb - which has been long suspected - but that it has become a major nuclear power. Israel now ranks as the world's sixth most powerful nuclear power, afterAmerica, the Soviet Union, Britain France and China - with an arsenal far greater than than those other countries, such as India, Pakistan and South Africa, which have also been suspected of developing nuclear weapons. It has possessed its secret weapons factory for more than two decades, hiding its plutonium extraction processes from spy satellites and independent inspections during the 1960s by burying it beneath an innocuous, little used building. The plant is equipped with French plutonium extracting technology, which transformed Dimona from a civilian research establishment to a bomb production facility. Plutonium production rates amount to 40 kilograms a year, enough to build 10 bombs. In the past six years Israel has added further equipment to make components for thermo-nuclear devices. The 26 megawatt reactor, also built by the French, has been expanded and is probably now operating at 150 megawatts to allow it to extract more plutonium. An ingenious cooling system disguises the output. The nuclear scientists consulted by The Sunday Times are convinced by Vanunu's evidence. They calculate that at least 100 and as many as 200 nuclear weapons of varying destructive power have been assembled - 10 times the previously estimated strength of Israel's nuclear arsenal. The scientists include Theodore Taylor, one of the world's most experienced nuclear weapons experts. He was taught by Robert Oppenheimer, the father of the atomic bomb, and worked on America's first bomb designs. He later went on to head the Pentagon's atomic weapons test programme. He added that Vanunu's testimony was entirely consistent with an Israeli capacity to produce 10 nuclear weapons a year that are significantly smaller, lighter and more efficient than the first types of weapons developed by Russia, America, Britain, France or China. Another scientist who authenticated the evidence uncovered by Insight is Dr Frank Barnaby, a nuclear physicist who worked at Aldermaston, the British nuclear weapons research establishment in Berkshire and who recently retired as the director of the Swedish Institute for Peace Research, which monitors nuclear profileration. Vanunu says that, despite tight security, he was able to smuggle a camera into Machon 2 and take more than 60 photographs. Insight debriefed him for four weeks and invited Barnaby to interview Vanunu in an attempt to find scientific flaws in his story. 'His testimony is totally convincing,' concluded Barnaby. The assessments of Taylor and Barnaby have been confirmed by other top nuclear scientists who were shown the pictures and detailed evidence. Because they work in sensitive positions in Britain's atomic energy industry and nuclear weapons manufacturing they have asked to remain anonymous. 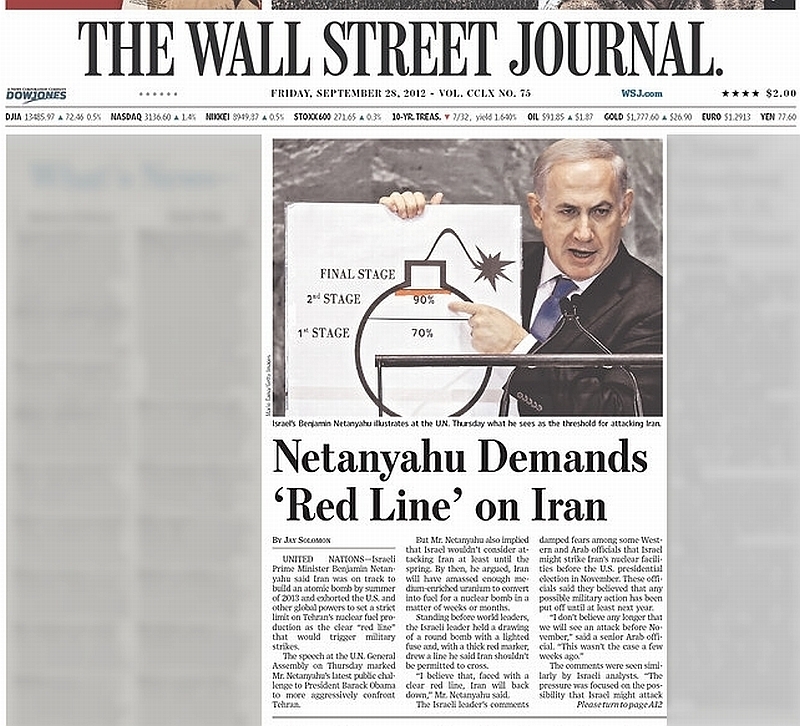 President Obama threatens Iran and Syria: "I will always stand with Israel"